I believe I forgot to talk about the Chinese New Year to my students. I'll have to do it when we get back from break. I love the drawing of the knot. I think it looks great without colour. These are both beautifully done! 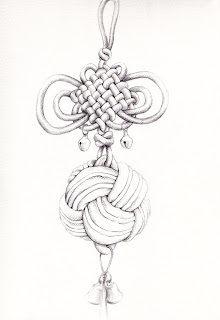 I like the knot as it is, but imagine it would be lovely with color too. Wow, these are so so good! The fish look so delicate and the knot is so perfect! Great job, Debra! I vote yes for coloring the knot. Your work is beautiful. Absolutely beautiful drawings! I love the fish; the colors used, the care taken with the details. The knot. Oh my goodness! I click on it and saw your details. You are a girl after my own heart. lol! Just an all around beautifully done drawing. your blog is lovely -- very beautifully drawn! The hanging fish are gorgeous. I just discovered your blog and I love it. Happy and creative year for you too! Happy Year of the Tiger to you! I love the hanging fish! Your work is so consistently beautiful! The fishes are whimsical and so interesting. The knot so patiently done, and visually engaging. Happy New Year! I agree. Everything is so beautifully drawn. You have a wonderful touch to everything you draw. Happy New Year to you too! Great works, as always here on your blog! The knot is wonderful just as it is! 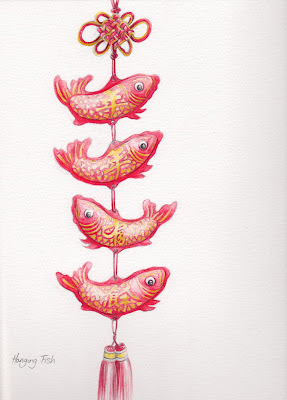 Fantastic Chinese New Year drawings! I haven't celebrated with my family for 4 years now... I really miss it a lot.